Long road trips in your car are fun, but your luggage capacity could be limited. With people and pets in the car, there might not be enough space for all the luggage and equipment you need for your vacation. The easiest solution to this capacity problem is to attach a cargo basket to your vehicle. It’s an ingenious space-saving solution that would move luggage from the interior of the vehicle to the exterior. You can generally enjoy more space inside the car when you use a cargo basket. You can also add more luggage, especially large items, with a cargo basket. A cargo basket would be one of the most useful car accessories you could ever buy. But these neat items are also a bit expensive, depending on the brand. You would have to spend over a hundred bucks for a car cargo basket. Therefore, it’s important to scrutinize the products available and choose the right one. This article lists the best cargo baskets money can buy. If you are looking for a sturdy, durable, and highly functional cargo basket, read below for reviews of the best products available. There are several things to consider when buying a vehicle cargo basket. The price is hardly the only concern. Vehicle cargo baskets differ depending on how they attach to the vehicle. Do you want the cargo basket on the roof, back of the car, or in the front? Mounting Style – This should be the main consideration when buying a vehicle cargo basket. There are three mounting styles for cargo baskets: rooftop attachment, rear mounting, and front mounting. The choice is up to you. However, it’s best to choose the mounting style depending on your needs and driving requirements. For example, you won’t be able to back up the car as usual with a rear mounted cargo basket. Dimensions — Not all cargo baskets suit every type of vehicle model. The dimensions of the cargo basket will indicate whether it’s possible to be fitted onto your vehicle. The dimensions also indicate how deep the cargo basket is for keeping luggage. Rust Resistance — This is an important factor that determines how long the cargo basket would last. Cargo baskets are only made from metals and metals rust. Corrosion would make cargo baskets unsafe and unsuitable for driving with. Therefore, a good product should have a solid level of rust resistance, or you would have to apply a rust-resistant coat yourself. Use the three factors above as starting points in your search. Read the buyer’s guide below for more detailed information on how to choose a vehicle cargo basket. Why we like it: The Reese Explore Rambler is an incredibly well-built cargo basket that is ideal for long road trips. The design is long-lasting and highly stable. The Rambler is sturdily built to carry serious cargo like bikes, luggage, heavy gear, and just about anything similar. 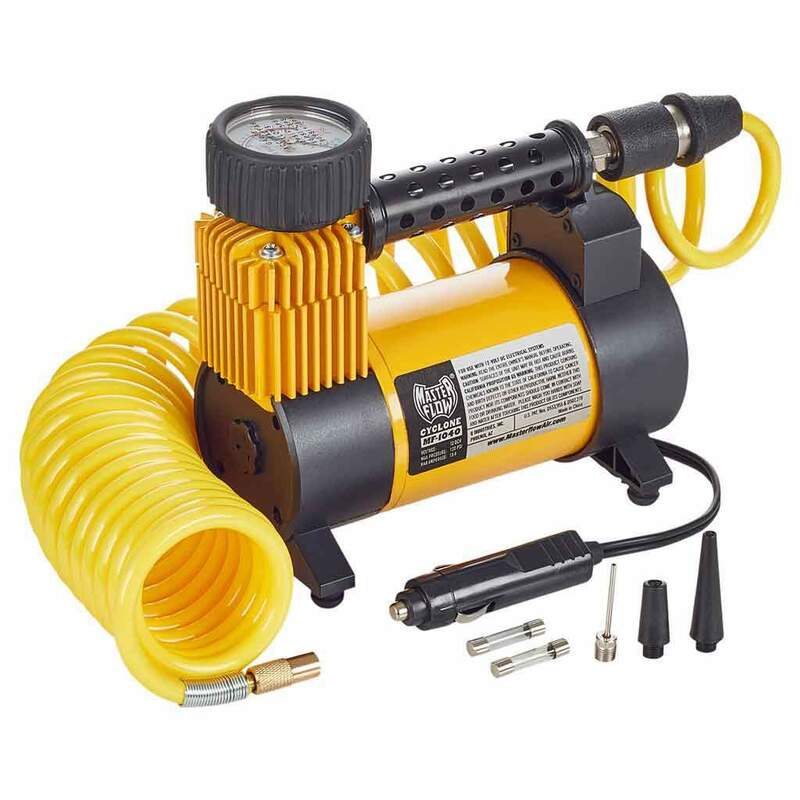 It has immense capacity that will be very useful for road trips, camping vacations, trekking trips, and so on. This is a 60 x 24-inch cargo basket that is sturdily designed to carry as much as 500 pounds. It has 5.5-inch side rails and mesh floors. The overall design is very rugged. The shank design can be elevated above the ground. The cargo basket has a powder coat finish that is resistant to rust, scratches, and the elements. The cargo basket can be fitted with 2-inch square receivers. The side rails are very adept at securing cargo in place. The mesh floors can be very easily cleaned. Ground clearance is improved thanks to the shank design, and this cargo basket will be able to withstand rough weather without any issue. The construction of this cargo basket is very durable thanks to the superior finish. The cargo basket secures like a rock behind the vehicle and can withstand most things the road throws at it. The assembly is fairly easy. While this cargo basket is well built, it’s also very heavy. It would require at least two people to insert into a hitch. One downside is that this cargo basket is not visible from the side mirrors. The cargo basket extends to the back quite significantly, so drivers will have to be careful when reversing the vehicle. This is a well-built cargo basket that would be very durable on the road. It’s sturdy and can carry heavy cargo without an issue. The drawbacks are minor compared to the many benefits. Why we like it: This sturdy and expandable vehicle cargo basket offers the major convenience of roof mounting. It can be secured onto just about any car. This is one of the best car top cargo baskets currently available. It fits on the roof of the car so it will free up space in and around the vehicle. Unlike back attachable cargo baskets, this one will not add length to the vehicle. This rooftop cargo basket offers about 11 sq.ft. of cargo space. It’s about 36 inches large inside the basket. It mounts to the roof using base rails. If the cargo basket is too small, it can be extended using a Curt unit. The cargo basket is wonderfully lightweight so it doesn’t put excessive strain on the roof or the tires from the top. Assembly is surprisingly easy and can be done by only one person. The cargo basket features what’s called an “aerodynamic design.” The front of the basket has a windshield that will protect the cargo from incoming gust. It keeps the vehicle aerodynamic when driving on highways. This cargo basket can carry up to 300 pounds of weight. But this will most likely depend on the model of the vehicle. It is designed to carry heavy luggage bags and boxes. Because of the square shape of the roof rack, it will be difficult to secure something like a bike. The roof rack will fit onto just about any vehicle roof with the base rails because the brackets are made for universal design. However, do mind the dimensions because for some cars this would be too wide or too small. The rack is made of steel, which makes it sturdy, but also prone to rust. Keep in mind that this rooftop rack isn’t coated with an anti-corrosion covering. It could rain rust down the vehicle if corrosion is not prevented. This vehicle cargo basket is very convenient thanks to the roof mounting position. It adds a lot of space to the vehicle as well. It’s well-built, though the corrosion-prone steel material is a problem. Otherwise, it’s easy to mount and is long-lasting. Why we like it: This rooftop-mounted vehicle cargo basket is spacious, affordable, and more than suited for hauling luggage on the road. This rooftop cargo basket is particularly suited for SUVs. It can fit even on vehicles with factory installed roof rails as long as the length and width is right. The rack is very easy to assemble and will make long trips by car very much hassle-free. The Arksen rooftop rack is made from heavy-duty steel. It has a steel wind fairing to decrease noise when driving and also to reduce wind resistance. The cargo basket should be mounted using the vehicle’s cross bars. Mounting is easy thanks to four U-bolts, all universal. This rack would fit as long as the crossbars are up to 3.25 inches wide x 1.375 inches thick, or 1.375 in diameter for round bars. 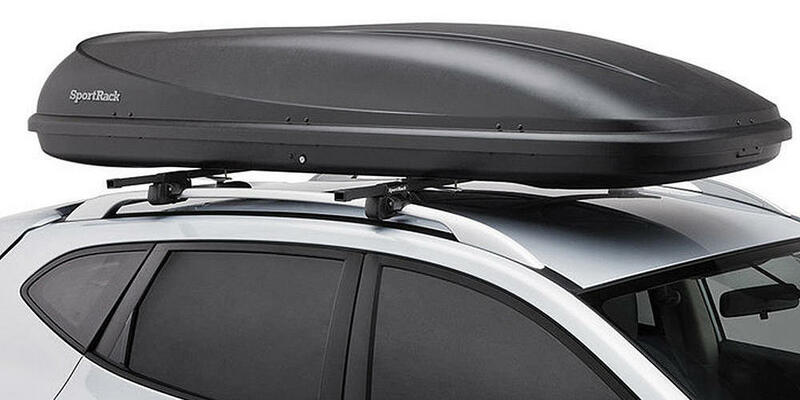 The cargo rack is suitable for most vehicles, but it would notably not fit convertibles. The construction sports a shiny black coat, but it is not rust-proof. Once installed, this cargo basket will be big enough to carry items like heavy bags, camping equipment, and similar luggage. 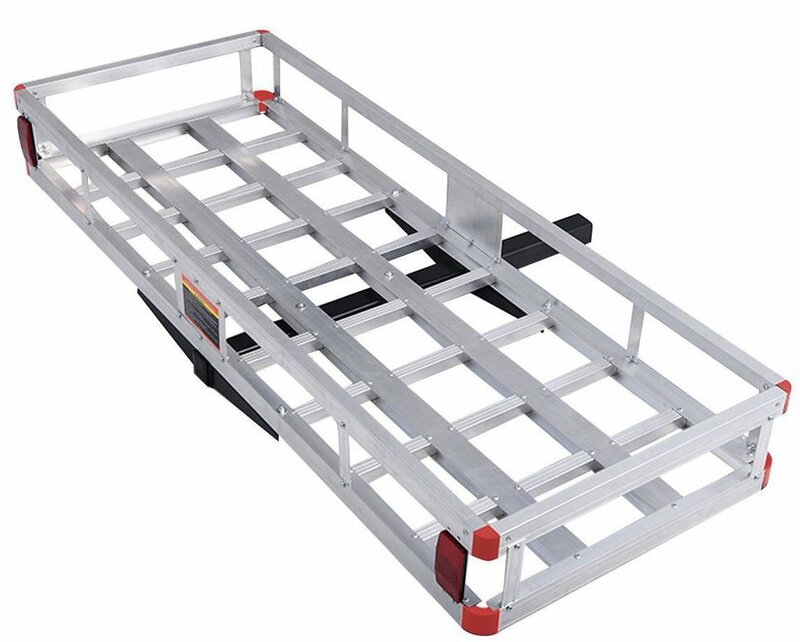 It has metal bars at the bottom plus side rails to keep the cargo well secured no matter the speed the vehicle is driving at. The rack has many tie-down points to secure luggage. The capacity can be considered extra large. The cargo basket will carry up to 250 pounds of weight. The packaging comes with a hardware set for mounting. Despite some minor downsides, this rooftop cargo basket is well worth the money. For starters, it’s quite affordable. The steel build is sturdy and it secures well. But it’s not corrosion resistant and will not fit convertibles. Overall, this is a great option for SUV owners on a budget after applying an anti-rust coating. Why we like it: The Curt 18153 cargo basket has many interesting design choices, including an angular, folding shank, that makes it highly convenient and well-suited for certain types of vehicles. The Curt 18153 cargo basket offers many very convenient benefits. For starters, it has hitches that allow it to be mounted on the front or the rear. It’s a large carrier suited for carrying any type of luggage mainly. The basket can be fitted to most vehicle makes as well. Very conveniently hitch mounted, this cargo basket is designed with sides that are 6 inches tall each. The advantage here is that the sides offer more support to secure the cargo for traveling. The shanks come in two sizes: 1 1/4 inches or 2 inches. The cargo basket is made from heavy-duty, tubular steel with a powder coating. It’s very durable and sports a rust-resistant E-coat. The base of the basket is mesh so it’s very easy to clean debris. One very interesting design aspect is the folding shank. It can be folded when the cargo basket is not in use. The shank is also angled, which allows it more ground clearance. This feature is mostly beneficial to low-riding vehicles. This cargo basket is well suited for carrying most types of luggage, no matter the shape. It’s very easy to install and clean. The mesh base is not only easy to get clean, it’s very sturdy and strong as well. The manufacturer claims that this cargo basket can carry about 500 pounds of weight. But considering the size, the capacity is more like 300 pounds. The folding shank allows much ground clearance thanks to the angled design. The tilting up when not in use is really adds to the convenience. Installation, however, can be a challenge because the fabrications are not exactly made. It would take a while to set this up on a car. This is a wonderful cargo basket that can hold a ton of luggage items. Attaching and securing the cargo is easy. The shank design makes this perfect for low riding vehicles. Once installed, it’s nearly the perfect cargo basket. Why we like it: The Tyger vehicle cargo basket is very pragmatically designed for hauling luggage up to 150 lbs without a hassle. It’s a universally fitting cargo basket. With 47.25 x 36.6 x 5.9-inch dimensions, the Tyger vehicle cargo basket is mid-sized. This car rack is designed to fit any type of vehicle thanks to the very flexible installation. For car top mounting, it would require a crossbar and roof rails. This cargo basket can hold up to 150 pounds of weight. It comes with a no-hassle warranty from the manufacturer. The cargo basket comes in two pieces that need to be assembled after unpacking. All the mounting hardware necessary is provided. The cargo basket has a one-inch tall steel frame for better securing of luggage. There are many tie-down points provided to rope in luggage for superb securing. The gear can be better secured with a cargo net too. The steel frame is coated with a rust-resistant E-coating. There’s no risk of corrosion or rust trickling down the body of the vehicle in rain. 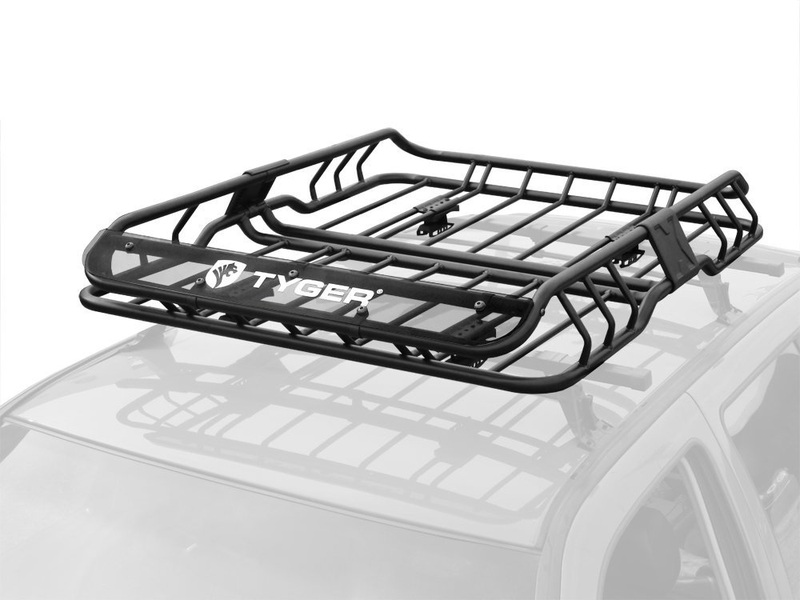 The Tyger cargo basket is mainly designed for roof mounting, but it can be attached to the front or the back of the car as well. The car rack is a universal fit. The package comes with a rubber pad to match size differences if there is any. This cargo basket is amazingly simple to install. It won’t take longer than 30 or 40 minutes to place it on a car. As long as the vehicle has a crossbar, installation should not pose a problem. The design, in general, is very stylish so having a roof rack doesn’t ruin the overall look of the vehicle. This cargo basket is designed to be functional and blend with the look of the vehicle. The cargo basket is easy enough to keep clean or wipe off in case anything spills on it. The car rack must be removed before taking the vehicle to a car wash. This cargo basket would be perfect for use with multiple family vehicles. It will fit any model as long as the there are crossbars and roof rails for mounting. It’s sturdily designed with security in mind. The rust-resistant coating eliminates any need to manually apply a corrosion-free coating. Why we like it: It may be simple looking, but the Rola V-Tex cargo basket is well-constructed and very sturdy. It’s designed for casual vacationer use. The simple looks can deceive the amazing functionality of this cargo basket. The price tag isn’t too bad and is well worth it because of the well-made construction. 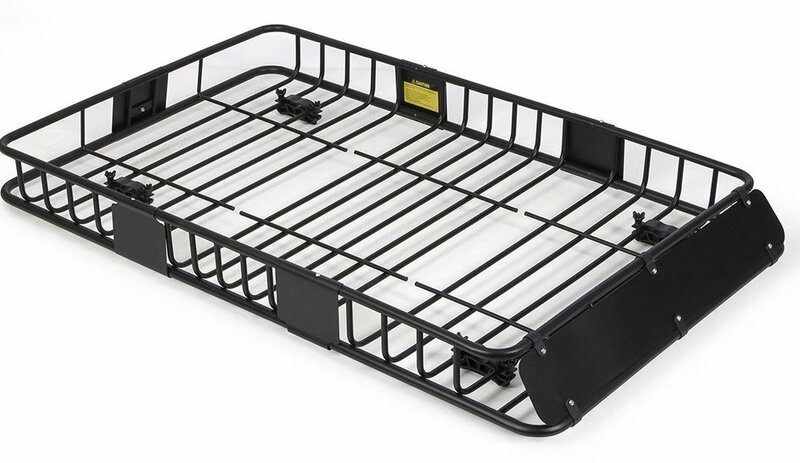 The rack is relatively low but is great for hauling luggage on road trips or when going camping. This cargo basket has an aesthetically pleasing two-piece design that can carry up to 300 lbs. It comes with universal mounting hardware that would fit on many types of vehicles. The mounts included are round and square to fit in most OEM racks. The cargo basket has relatively low sides. The top and bottom tubes have different diameters. The top tubes are slightly thicker than the bottom one. The cross pieces connecting the basket are 3/4 inches in diameter. The cargo basket comes with a custom fit air deflector. This cargo basket is built to last. However, the construction doesn’t include rust coating. This cargo basket is built to carry everyday items on a car. It sports a very solid workmanship. However, it’s not properly powder coated. Rusting can be prevented with caulking. It lacks a windscreen so there will be noise when driving. The wind noise can be significantly loud compared to road noise. Installation is relatively easy but the screws can come loose. Each should be screwed in and locked tight to keep the basket from flying off the roof. This rooftop cargo basket can put external pressure on the roof bars. Too much weight might even crush it. This is a small and neat cargo basket that is undeniably made well. However, it has its issues. Mainly, it’s very noisy thanks to the lack of a windscreen. Screws can come loose as well. But all these problems are preventable. Other than that, the cargo basket works exactly as intended. Why we like it: The Goplus cargo basket is very lightweight thanks to a mostly alloy frame. It works great with most cars. 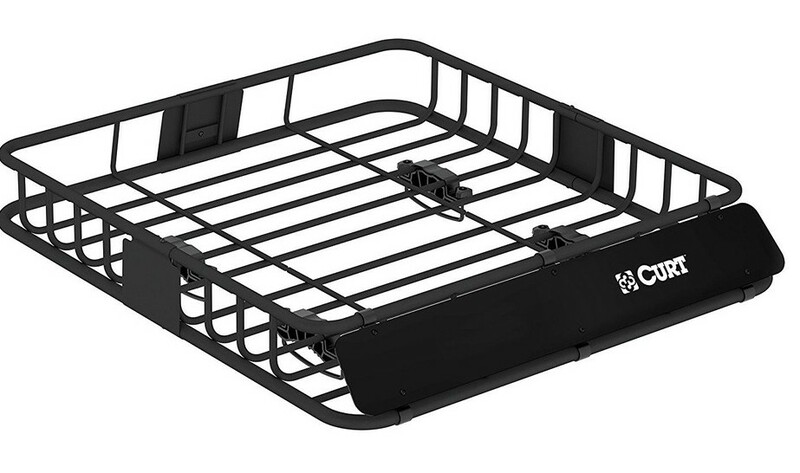 Unlike most vehicle cargo baskets, the Goplus car rack is made from alloy. The advantage is that this cargo basket is much more lightweight compared to the steel alternatives. Indeed, it weighs only 20 lbs, when the average steel cargo basket can weigh as much as 70 lbs. Aluminum is less likely to corrode than steel as well. This alloy car rack is 60 x 22 inches, plus 7 inches tall. It’s large enough to carry extra luggage when the in-car space runs out. 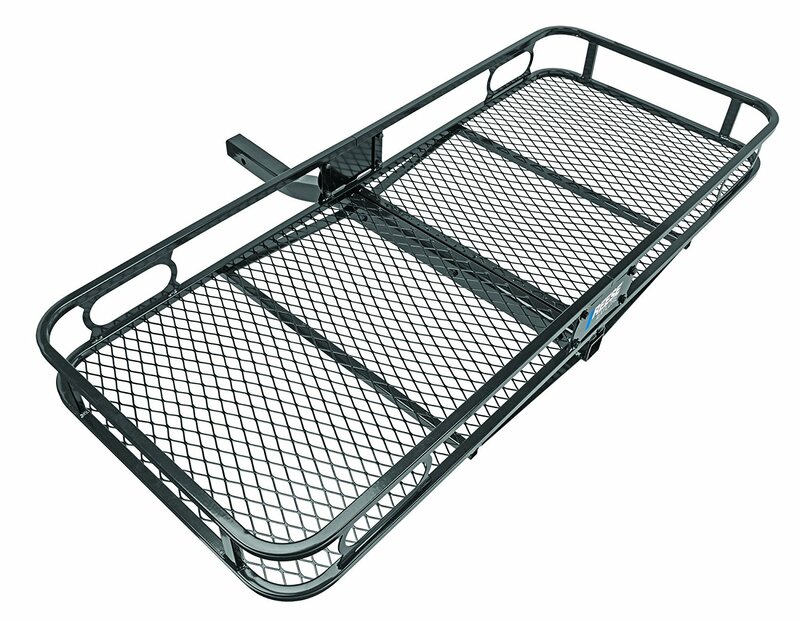 While the main body of the cargo basket is made from aluminum, the hitch crossbar is made from steel. But the crossbar doesn’t add much to the weight. The cargo basket has a silvery body that is constructed to last. The basket is deep because of the 7-inch sidebars, so it will hold most baggage. This alloy cargo basket is very spacious and can haul as much as 500 pounds. It’s very sturdily built with excellent ability to secure luggage. It can secure most types of luggage. However, it won’t support a bike rack or a surfboard. The cargo basket is best for carrying cloth luggage bags. Because the cargo basket is lightweight, it’s not hard to install or remove. This cargo basket can fit well on SUVs, pickups, and cars. The cargo basket doesn’t have a mesh bottom so small items could fall out. There are large squares to hold large bags of luggage. It’s recommended not to put any small luggage bags in here if there’s a risk of them squeezing out. It’s possible to place plastic storage bins in this cargo basket because there’s no mesh hold. This is a great cargo basket and a rare find considering it’s made from alloy. It won’t rust easily. It’s lightweight and easy to handle. Plus, the sturdy construction will last long. 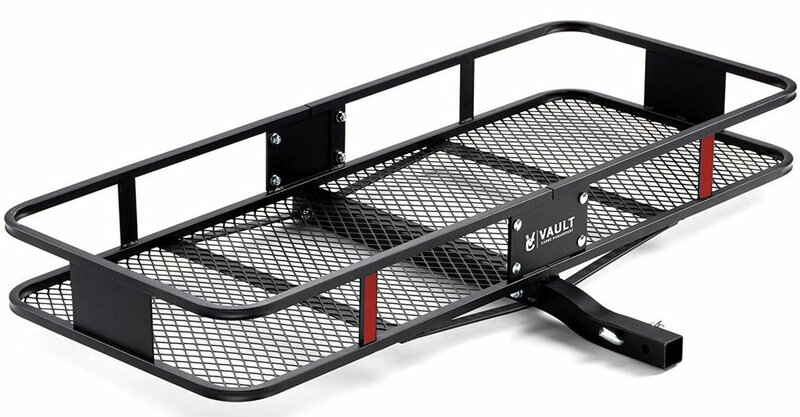 Why we like it: Cargo Hitch Carrier by Vault is very sturdy, very spacious, and very easy to assemble. 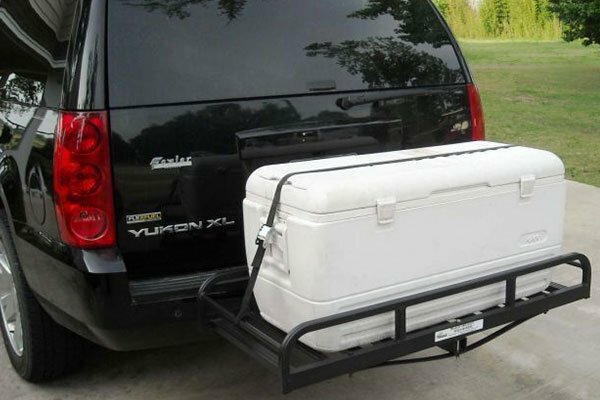 Cargo Hitch Carrier by Vault is a great investment for vehicle owners that could increase the storage capacity of the vehicle. This cargo basket would clear up about 500 lbs of weight from inside the car. It’s great for road trippers who want to carry luggage, coolers, and camping gear without risking anything falling off. This cargo basket is designed with an interior space of 22.5 inches. There’s enough basket space to carry space-consuming vacation items such as coolers and small suitcases. The capacity of this cargo basket is 500 pounds. You can carry a loaded cooler plus more gear on this cargo basket. It comes with a free 5/8″ hitch pin and clip. The cargo basket’s hitch shaft is redesigned in a manner that elevates it from the ground. As a result, the luggage won’t be exposed to exhaust fumes. This cargo basket is compatible with any 2-inch receivers. If present, the cargo basket can just be plugged in and ready to go. The cargo basket includes a universal mount. It enables the car rack to be installed on SUVs or RVs, among other vehicles. This cargo basket is well-built and easy to install. To complete assembly, all a car owner has to do is to insert the 2-inch shaft into the car’s receiver, insert the hitch pin, and that’s it. Afterwards, the car can be driven. This cargo basket adds a lot of extra storage to carry essential gear like coolers. The luggage secures well and won’t rattle even when driving uphill. It’s great for fitting any type of gear including cargo bins, boxes and even a camping tent. A bike can be attached to the back tube. Keep in mind, though, that not all bikes will fit. This design is very sturdy so vacationers can drive in peace. For extra stability, it’s possible to add a hitch stabilizer. One major downside is the finishing quality of the product. The reflector is placed sloppily so the hitch mounting will be affected. The mount might not even be visible because of the small reflector placement. This cargo basket is well-designed for family use. It mounts easily on SUVs and RVs. Using this cargo rack is no hassle. It’s sturdy and stable. It has a coating so the frame is largely resistant to rust as well. There’s a made-up steel mesh on the floor so everything would be held in place. Why we like it: It can carry as much as 600 lbs. Attaching is easy and it’s built to be very durable. The Rola 59502 cargo basket is a high capacity product designed for long road trips. It has a moderately deep basket to strap luggage on to. This cargo basket has a great weight to capacity ratio and will hold on even when driving on mountainous terrain. This cargo basket is designed with high capacity in mind. The 5.25-inch basket isn’t too deep, but it’s great for strapping on most types of luggage. It would free up interior space for other things. The cargo basket can hold common road trip luggage like camping gear, equipment, and bags. The frame is built to last. The cargo basket frame is made from high-quality steel intended for heavy-duty use. The cargo basket is coated with a black powder coating that will protect the basket against the elements and rust. The coated steel frame doesn’t scratch either. It’s very strong and quite heavy because of the steel construction. The two-piece cargo basket is very easy to assemble. It has attachment points for the vehicle license plate for rear assembly. It attaches to 2-inch square receivers on cars, SUVs, trucks, vans, and several other large vehicle types. It mounts to the hitch receiver hitch only, not the roof rack. When attaching, make sure there’s nothing in the back like spare tires. These things would make it difficult for the back doors to open once the cargo basket is attached. The heavy-duty frame is built to last. You don’t have to worry about rusting. This cargo carrier can be upgraded by the brand’s own lighting system. Use incandescent or LED bulbs to lighten up the cargo basket anytime. The lights are optional of course. This sturdy cargo basket is well-suited for hauling heavy luggage. It has a massive capacity of up to 600 lbs. It’s also heavy as a result and will take two people to lift it! This is one of the biggest capacity cargo baskets currently available. While it’s heavy and only supports rear mounting, most owners would appreciate the extra space. It’s great for long road trips. Invest in the lighting system to use at night as well. Why we like it: This cargo basket maybe simply built, but it’s lightweight and highly functional. It’s easy to attach to any vehicle and will not hinder driving capability. 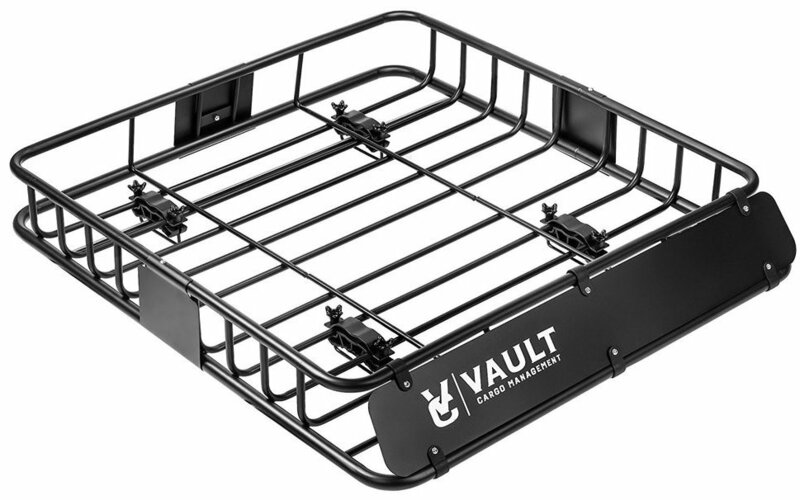 This Vault Cargo Management car rack comes with a universal mount as the name suggests. It’s a relatively small and simple cargo basket suited for most types of vehicles. 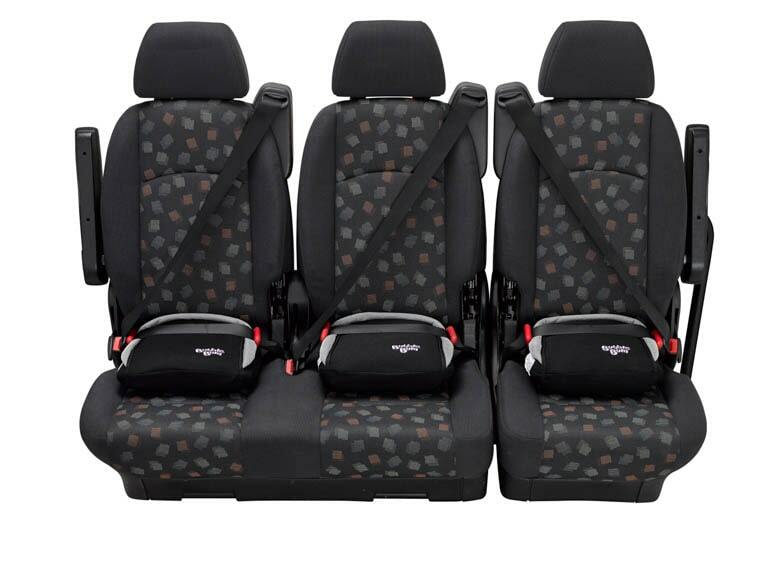 It has a capacity of only 150 pounds, which is more than enough for moderate needs. This cargo basket is suited for universal roof mounting. It will easily free up space inside the car and move luggage to the roof. It installs on existing crossbars or roof rails of vehicles. The design is aerodynamic. The cargo basket has a very low profile design so it won’t create wind resistance when driving. This is an ingenious design choice that doesn’t increase the price of the product. The cargo basket has steel bars to securely strap luggage. To hold small bags and similar small items, it’s recommended to use nylon netting at the bottom. This item is not included in the package. The cargo rack is small and supports only about 150 lbs. It’s great for drivers who don’t want a massive cargo basket that might add weight to the roof. Unlike rear mounted cargo carriers, it will not affect driving. The steel bars are designed with a slight tilt inward. This makes it easy to secure luggage. The low profile is also ideal to keep luggage strapped in without risking any flying off the rails. The steel material is sturdy, durable, and well-built. Because the cargo basket is small, it doesn’t add much weight. But do understand that the rack doesn’t have any coating. The risk of rusting and corrosion is high. It should be coated with caulk or rust-resistant paint if exposed to rain or moisture. This is a great, affordable product with only minor downsides. The aerodynamic design and low profile make this cargo basket quite perfect for smaller cars that don’t want to add too much weight to the top. It’s easy to use and assemble. Only rust is the problem, which can be solved by a coating. There are several factors to consider before purchasing a cargo basket for your vehicle. There are many options available on the market, therefore doing some preliminary research is essential for finding the best product. Before starting, it’s recommended to just browse the sheer volume of vehicle cargo baskets available. It will give you an idea of the type of products available so you can choose what you like. Not all vehicle cargo baskets come with a warranty. This is a car accessory and not a part. You may not be able to get a refund if you choose the wrong product. Essentially, look for a cargo basket that is very sturdy and attaches securely to the vehicle. Luggage can be secured in multiple ways using ropes, but the basket itself must have the required securing hardware. If you are driving on rough terrains, like mountains, the sturdiness of the cargo basket would matter a lot. You definitely do not want screws coming loose as you drive. It’s vital thus to read the buyer’s guide below to make sure you purchase the right cargo basket for your vehicle. These cargo baskets can be attached to the roof of the car. The main advantage of this type of cargo basket is that they come with a universal mount. Meaning these cargo baskets can be attached regardless of the type of vehicle. Your vehicle would require crossbars or roof rails on top to attach most rooftop cargo baskets. The products come with the attachments so installation is easy. When buying rooftop cargo baskets, the dimensions of the product should be a crucial consideration factor. Some baskets may be too big or too small for the roof. Therefore, measure the roof of your vehicle if you don’t already know how big it is to see if the product you have in mind would fit. Rooftop cargo baskets can also get noisy when there isn’t sufficient wind resistance. The best cargo baskets for roofs sport an aerodynamic design that eliminates much of the wind resistance. These types of cargo baskets are attached to the rear of your vehicle. The cargo baskets are typically installed with a hitch attachment. Most drivers prefer rear attachment cargo baskets for carrying certain items like bike racks or surfboards. However, keep in mind that not all cargo baskets can support items such as bike racks. Rear mounted cargo baskets might be able to carry more weight if you drive a small car. Heavier cargo baskets are best mounted on the rear. Drivers should be aware that if there’s a cargo basket attached to the rear, then reversing and backing up should be done with care. Don’t forget that a rear mounted cargo basket would add extra length to the vehicle. One concern with rear mounted cargo baskets is the proximity to the exhaust pipe. The basket should be able to avoid the exhaust pipe to prevent luggage smelling like fumes. These types of cargo baskets are rare but are still popular among some. Front mounted cargo baskets function similar to rear mounted versions. Drivers who don’t like the cargo mounted in the back because it hinders driving ability may prefer the front mounted alternative. These also come with hitch attachments. The luggage would have to be secured low to avoid it blocking the view of the road. Front mounted cargo baskets should be sufficiently aerodynamic and also very sturdy. Drivers should be able to keep their eyes on the road, and not on the cargo. Some cargo baskets have multiple mounting systems, such as rear and rooftop. These are advantageous depending on the driving situation. Take note of the exact dimensions of the cargo basket: height, length, and width. The height and width should be sufficient to attach the cargo basket to the roof of the car. The length would indicate how much longer a rear mounted cargo basket would make the vehicle once attached. It’s important to keep this measurement in mind when driving. The height of the cargo basket indicates how deep it would be. The deeper it is, the more luggage you can shove in. However, you might not want a cargo basket that is too deep if you are roof mounting the product. A cargo basket that is too deep might increase wind resistance while attached to the roof. More wind resistance means more exertion on the tires and more noise. Cargo baskets vary greatly in how much luggage each can carry. The maximum weight a cargo basket can carry typically maxes at 500 or 600 pounds. Most cargo baskets can carry about 300 pounds of weight. Small cargo baskets carry 150 pounds of weight typically. It’s up to you to decide how much capacity you want. However, when deciding, keep the size of your vehicle in mind as well. Smaller cars may not be able to adequately support a massive cargo basket that can haul 600 pounds. Cargo baskets are mainly made from heavy-duty steel. Some are also built using alloy. Steel cargo baskets are highly preferred because these are very sturdy, stable and well built. Steel cargo baskets also add weight because the metal is heavy. That means additional weight in addition to the weight of the luggage. More weight just puts a strain on the tires. If you want a lightweight option, you can choose a small cargo basket or choose an alloy product. Aluminum is generally more lightweight than steel. Another advantage that alloy has over steel is rust resistance. Steel cargo baskets are notoriously rust prone unless there’s a coating. If it rains, a corroded steel cargo basket could cause the whole car to be covered in rusty water. Therefore, if you are buying a steel cargo basket, make sure it’s coated with a rust-resistant material. If not, you will have to paint caulking yourself.